A public healing music and multi-media performance kicks off an experiential weekend workshop where musicians, spiritual seekers, healers, psychotherapists, shamanic practitioners, and yoga teachers will discover the healing art of sound and consciousness transformation, March 2 to 4, 2012, at EarthRise Retreat Center at the Institute of Noetic Sciences. Open to the Public: "A Musical Offering with Silvia Nakkach & Friends” will use inspired melodies from the magical realms - pieces that span 3000 years – to promote human resonance through devotional sound. 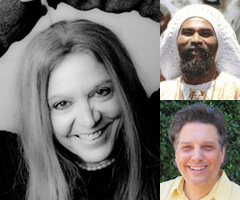 Musicians, spiritual seekers, healers, psychotherapists, shamanic practitioners, and yoga teachers will tune in to the healing art of sound and consciousness transformation at Medicine Melodies, an experiential weekend musical workshop March 2 to 4, 2012, at EarthRise Retreat Center at the Institute of Noetic Sciences. Silvia Nakkach, named by Utne Reader magazine as one of 40 cutting-edge artists who will shake the art world in this new millennium, will lead the workshop with voice and wisdom to transport listeners into the heart of devotion. She specializes in medicine melodies, which are simple tonal configurations that reflect a sacred unity with nature and have the power to heal body, mind, and spirit. Open to the public's musical interests and curiosity: the retreat’s Friday evening event, A Musical Offering with Silvia Nakkach and Friends features an in-depth music experience and multi-media presentation. It runs from 7:30 to 9:30 p.m. on the EarthRise campus. Cost for the Friday evening is $25 at the door. Cost of the full weekend workshop is $295–$325, which includes meals. Lodging is extra. Workshop attendees are guaranteed a seat and free entrance to the Friday evening musical event. Visit the EarthRise website for a detailed schedule and registration. For additional information, contact Jan Fischer at 707-779-8202. The Medicine Melodies workshop will draw from shamanic music and the indigenous traditions of the Amazon, India, and Brazil. It will use guided trance states, drumming, and chanting to provide a repertoire of medicine melodies for use in healing sessions and developing a spiritual practice of “singing in.” Participants will learn how to implement music in healing practices, discover the use of music to support the shamanic journey, gain confidence in voice, and learn the basis of music improvisation and deep listening. Val Serrant will provide instruction and percussion accompaniment. “A Musical Offering with Silvia Nakkach & Friends” will use inspired melodies from the magical realms - pieces that span 3000 years – to promote human resonance through devotional sound. The evening includes audience participation, a multimedia presentation, and music to clear and open energetic channels. Silvia will be joined by Val Serran t, renowned steel pan/traditional drummer, and Michael Knapp, classically trained cellist and composer. Silvia Nakkach, MA, MMT, award-winning composer, former psychologist, author, and pioneer in the field of sound transforming consciousness and music shamanism, is the founding director of Vox Mundi School of the Voice; and assistant professor coordinating the Sound, Voice and Music in Healing studies at CIIS. For more than 27 years, Silvia has studied classical Indian music with the late maestro Ali Akbar Khan. A new album (Medicine Melodies) and her new book (Free Your Voice) will be available this summer by Sounds True. Biographical information for Val Serrant and Micheal Knapp can be found on the EarthRise event web page.. See media contact to inquire about Mp3 files available for posting on websites and blogs. Located just 35 minutes north of San Francisco, EarthRise Retreat Center is a full service conference facility that caters to transformation learning experiences. Nestled among 194 acres of rolling hills and ancient oak trees, the center provides an environment to explore consciousness, ancient wisdom traditions, experiential learning, and modern scientific inquiry. At EarthRise at IONS, psychologists, educators, philosophers, frontier scientists, and spiritual masters lead transformational learning and lifestyle programs. For more information, visit the EarthRise website or contact Jan Fischer at (707) 779-8202 or workshops(at)noetic(dot)org.